International safeguards initiatives can help in different ways to support the development and strengthening of a country safeguards approach. Effective stakeholder participation in the development and implementation of the country safeguards approach, through guidance on managing multi-stakeholder processes and building capacity to facilitate participation of a full range of stakeholders including those that are marginalized and vulnerable such as indigenous peoples, local communities and women. Development of a safeguards information system, through guidance on a participatory approach to develop a system that provides credible and comprehensive information that can be used both to build support and attract finance to the REDD+ strategy and action plan, as well as to improve its design and implementation. Other safeguards initiatives support other steps and elements of the country safeguards approach. The Strategic Environmental and Social Assessment (SESA) conducted by countries participating in the Forest Carbon Partnership Facility supports an assessment of risks and opportunities of proposed REDD+ strategy options to feed into the definition of the goals of the country safeguards approach. It also involves an assessment of the legal and institutional framework. The Environmental and Social Management Framework (ESMF) that is a product of the SESA provides a framework for development of mitigation action plans of procedures to follow to ensure that World Bank operational policies, ‘safeguards’, are met. The UN-REDD Benefits and Risks Tool (BeRT) helps to conduct a legal analysis with respect to the country’s goals for safeguards. The UN-REDD Participatory Governance Assessment (PGA) and the Governance of Forests Initiative (GFI) of World Resources Institute helps to identify governance indicators for the SIS, and to analyze and strengthen institutions with respect to governance. 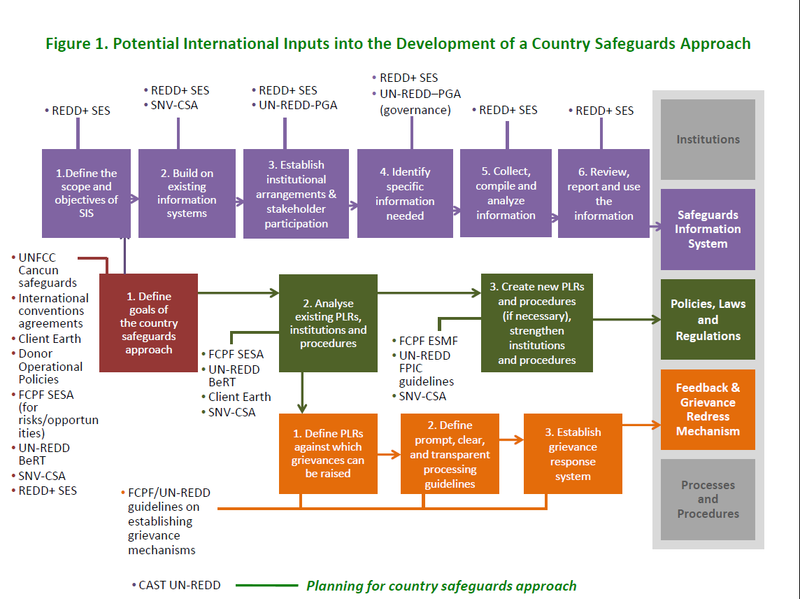 The UN-REDD Country Approach to Safeguards Tool (CAST) helps with planning the development of the full country approach to safeguards. The Country-led Safeguards Approach (CSA) guidance of SNV also helps to plan the identification of goals for the country safeguards approach, the legal analysis and the identification of existing information systems. The Client Earth Guide for Understanding and Implementing REDD+ Safeguards using international legal instruments can be used to assist with the legal analysis.